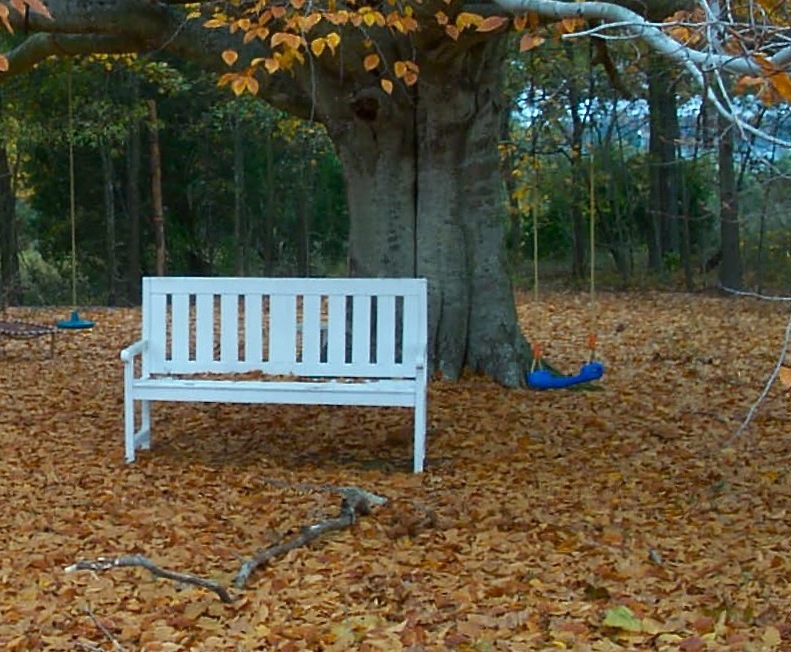 There are several members of the Fagus genus of beech trees, such are Japanese, Chinese, European or Mexican beech but the only one native to America is the Fagus grandifolia, the American beech. These are fairly common and widespread trees found throughout the eastern United States from Canada to the Florida panhandle. 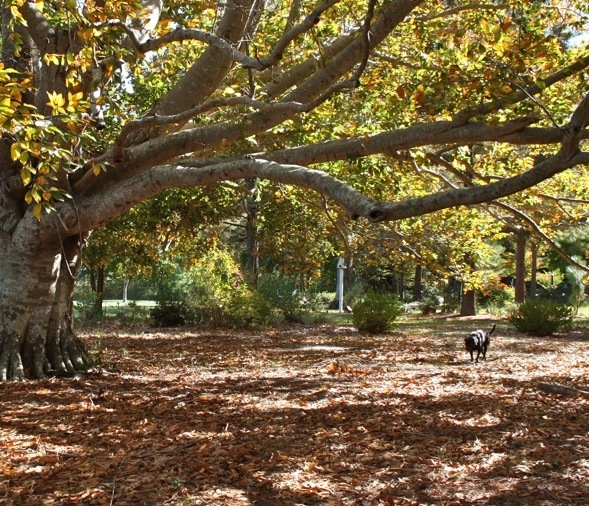 We have one large beech, height about 75-feet, growing near the waterfront. The canopy is rounded and full and the branches are wide spread and sturdy. 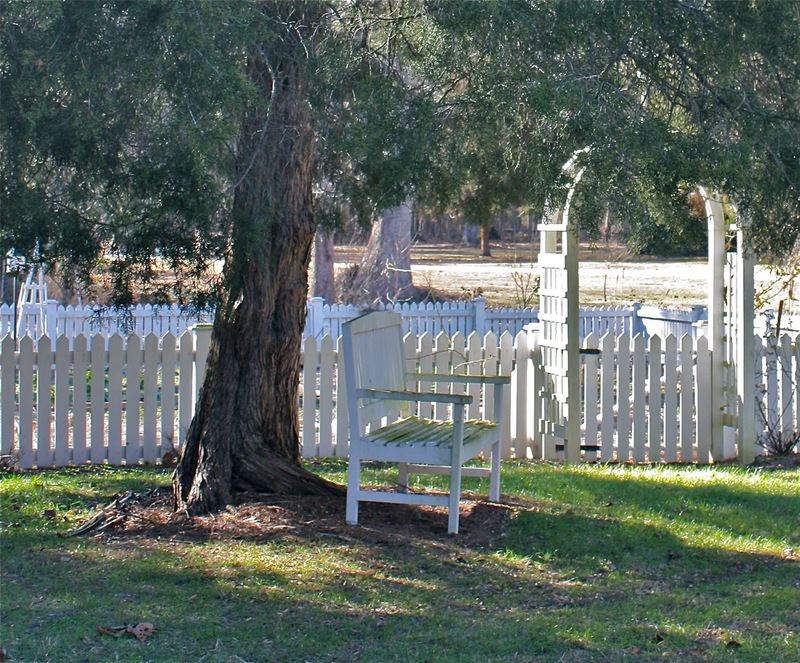 It’s always been a favorite spot for children and grandchildren to explore or swing on a rope or shimmy up into the heart of the tree. The beech tree is deciduous and our old tree loses most of its leaves, leaving a thick litter beneath where nothing else grows. 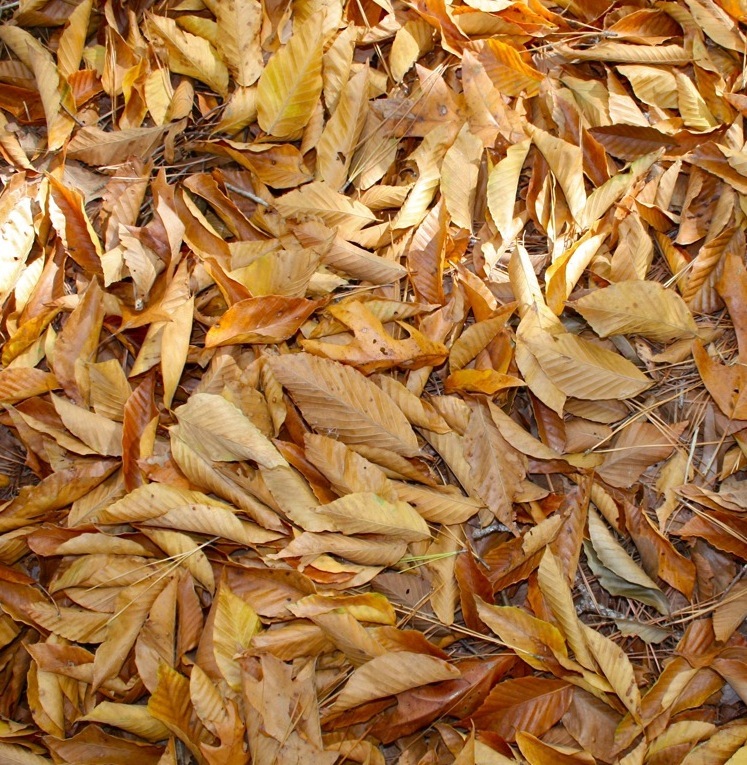 It’s said that the dried leaves from beech trees made choice mattress fillers for colonists and early settlers because there was a certain spring to the mattress and a pleasant aroma. 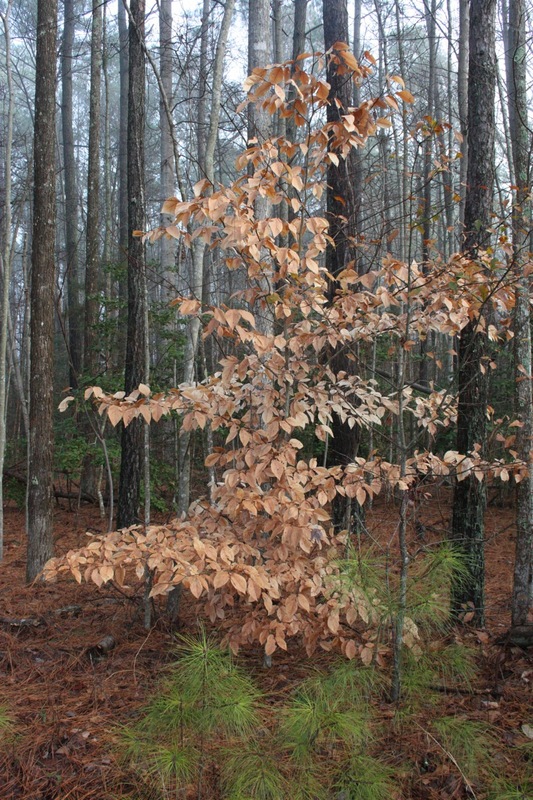 Young beech trees in the woods surrounding our home are easy to spot at a distance as the tan colored leaves remain on the trees during the harshest of winters. In late spring, bright green leaves emerge that turn a darker shade of green by summer. 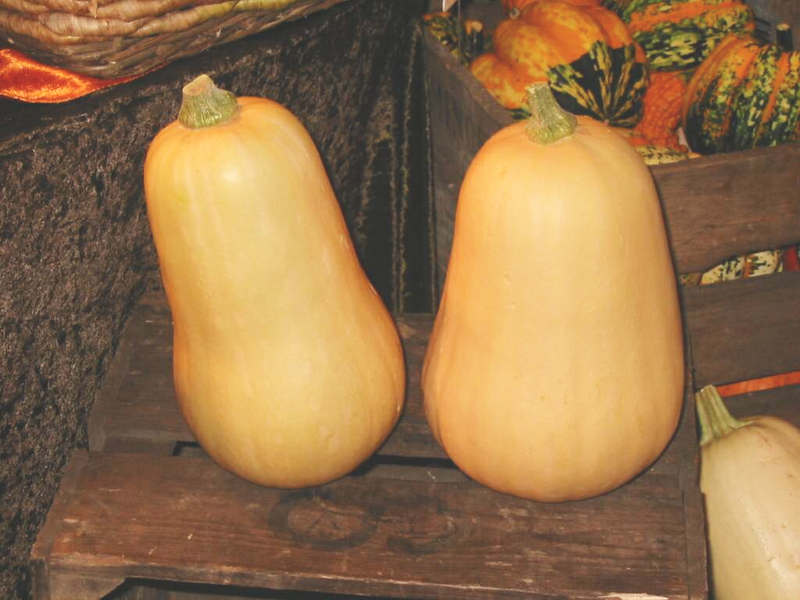 The fall season brings a golden yellow to the foliage for us to enjoy. Beech trees are very easy to identify by the smooth bark, oval toothed leaves with straight parallel veins and long sharply pointed buds. 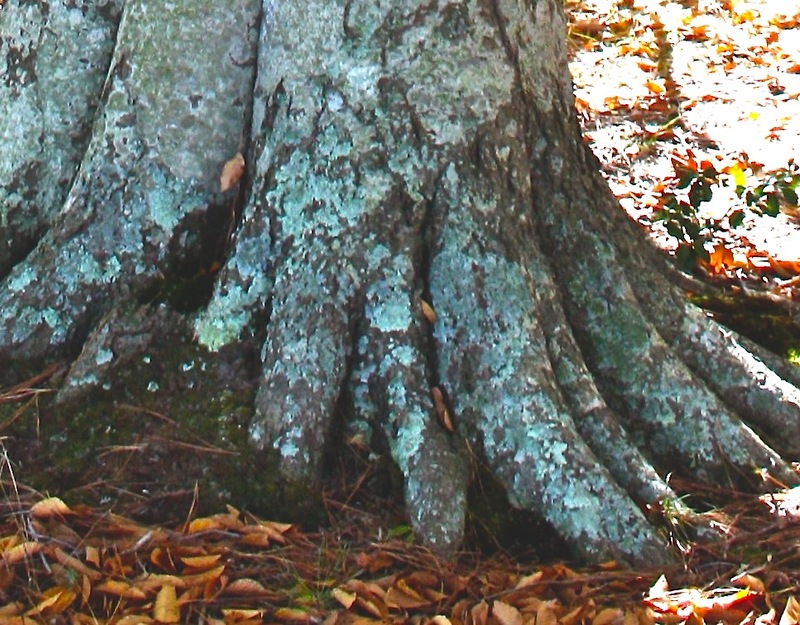 Some say the trunk of the tree resembles a leg of an elephant, a colorful description that delights the grandchildren. We have no idea if our beech is really old or not but I’m sure it has seen a lot of history on this little stretch of land. Gardening near the tree, we once dug up remnants of an oyster roast held long ago on the banks of this river, with a handblown wine bottle dating around 1800 and very large oyster shells discarded in a pit. Hmmmm… Wouldn’t it be fun to think that this old tree might have provided a little shade for the participants of that meal? 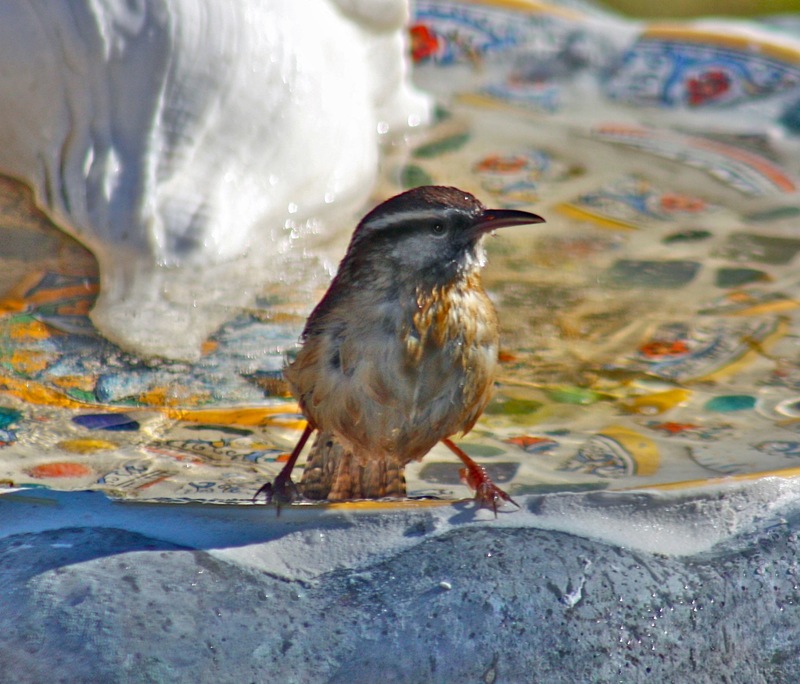 This fall I had an interesting adventure with a Carolina Wren, a common Virginia bird that many have found nesting in their flower pots, ball gloves, garages, etc. 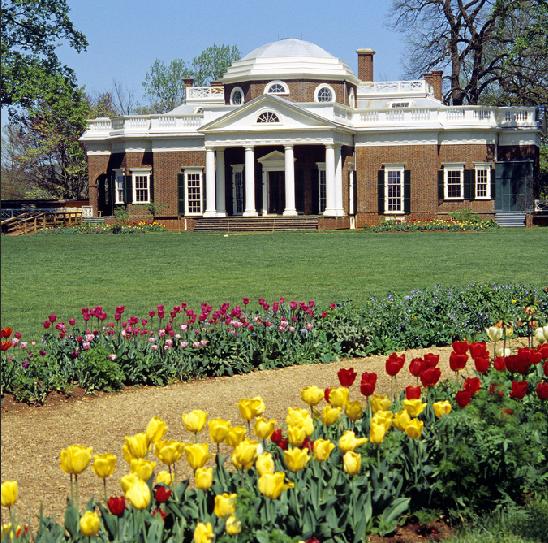 My adventure began when I was assigned to photograph the homes on our Historic Garden Week tour. I carry my digital SLR camera in an average size bag, much like a square lunch bag with interior partitions for the different lenses, flash, plus spare batteries and some odds and ends. I arrived at one site on Gwynn’s Island and went to work, grabbing the camera and flash, leaving the bag in the driveway well out-of-the-way. Some time later, job done, I repacked the camera bag rather haphazardly and tossed the equipment in the back seat, then headed home, about a 20 minute drive. Home is where the excitement began. I ate lunch, then decided to clean and repack the camera hardware. All was well until I pulled open the vel-croed flap on the flash sleeve. A young Carolina wren flew out with a flurry, almost colliding with my nose! Into one window, then another it flew. “Now you’ve done it,” said mister gardener. “You’ll never get it out.” All I had to do was open the door to the screened porch. Out it went. From there I could pick it off the screen and release it outdoors. The weather was cool but mild enough that it would be fine but I still worried about the little fella. This bird is unusual in that it mates for life and it remains in the same habitat where it nests! 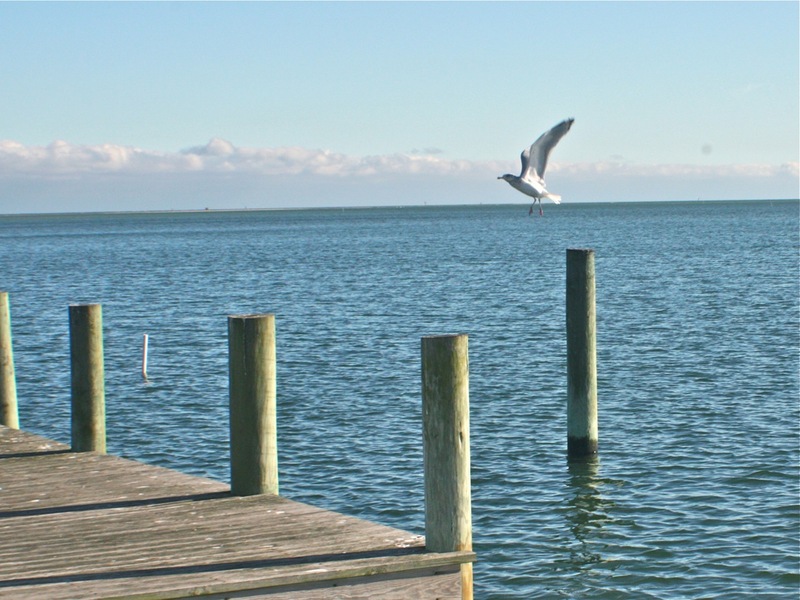 How will this new habitat affect this little bird? For weeks it sang loudly and sweetly all day long. For its mate, I figured. We’ve had our share of Carolina wrens who sing and warble, mostly while nesting but nothing like our lonely little newcomer. There were no others of its kind. The last pair moved on to new territory after threatened by a rat snake. 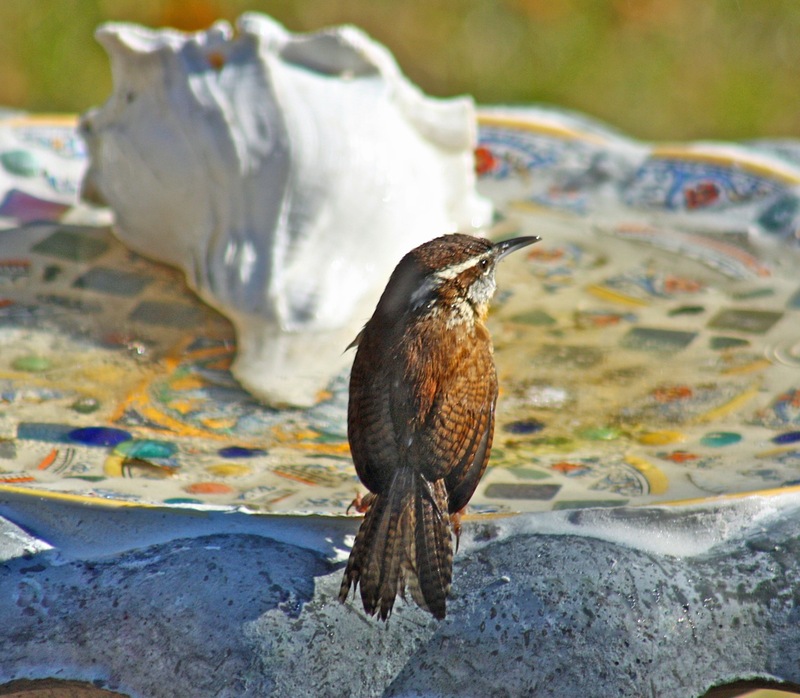 Our new Carolina wren stays close to the house, flitting from flowerpot to flowerpot, from tree bark to logs, and back to the herb garden looking for beetles, moths, crickets, and then to the feeder when the weather is harsh. It still sings all the day long and it seems to really like being near the screened porch. Twice it has reentered the porch. That makes me wonder. Does it think the porch is the portal back to its home and the home of its possible mate? It is an adorable little fella, much more friendly than usual. It allows me to reach out and almost touch it. 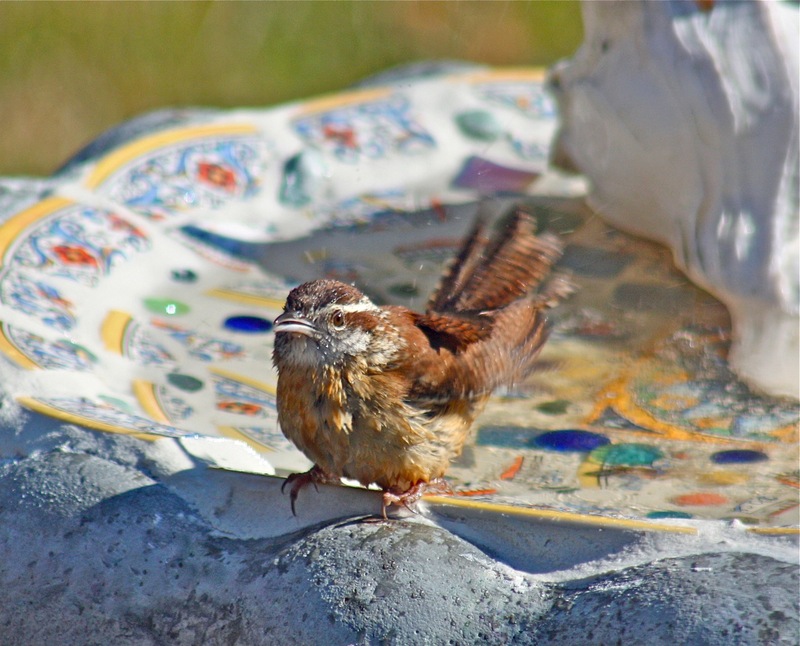 Our habitat would be a perfect place for it should another Carolina wren be seeking a mate. But I’ve made a decision. I want to return the bird to its homeland. Should it fly inside the porch one more time, it will be returned to the sleeve of the flash equipment, vel-croed shut and driven the 20 minutes back ‘home.’ Just hope the mate has not moved on…. 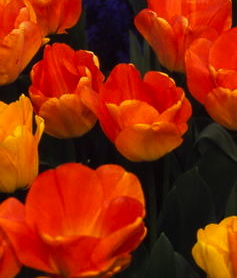 After returning from a trip to Keukenhof Gardens in Holland with Brent and Becky last May, I dreamed about seeing colorful tulips in my own gardens in 2011. Breathtaking would be an understatement to describe the Keukenhof rivers of tulips planted en masse of single colors that paralleled, twisted and merged like brilliant rainbows that had fallen to the earth. Endless paths throughout the 80-acres of woodland park with endless variety and patterns of 7,000,000 hand planted bulbs was more than eye candy. It bedazzled. 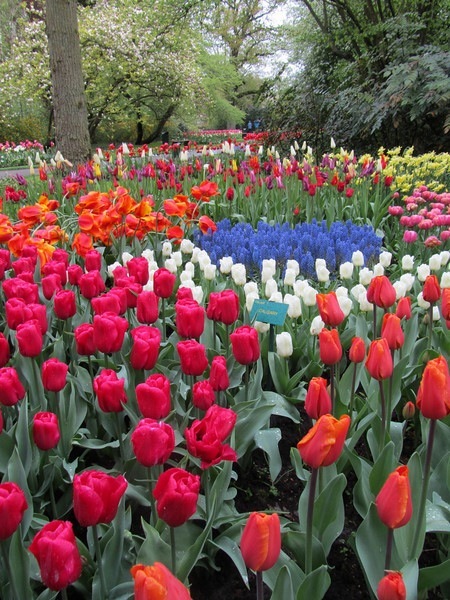 A profusion of muscari in shades of blue coiled around and about the tulips completed the colors of the rainbow. So I also wanted muscari… lots of muscari in shades of blues and whites and lavender planted for accent color. I wanted it around birdbaths, against the tulips, and accenting the stones around the frog pond. 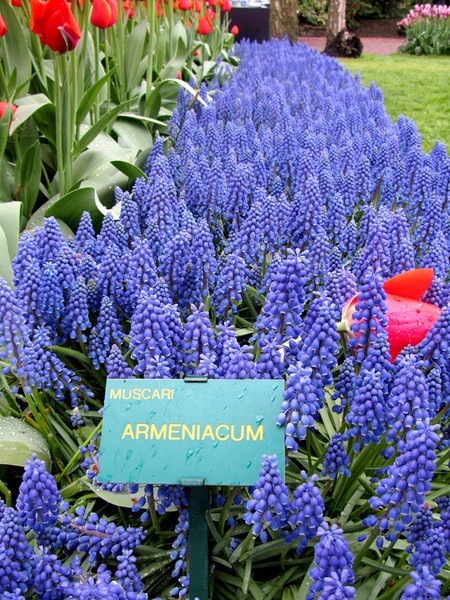 From Brent & Becky’s Bulbs last fall, I purchased cobalt blue muscari armeniacum and several other varieties that I had admired in Holland. And last week in a lull between snow days and icy days, I finally got the bulbs planted. It’s late in the season so I’ll let you know if they appear above ground this spring. Most of the tulips I bought were Darwin hybrid tulips from Brent and Becky’s Bulbs. This deep red “Come-Back,” thus named because it is a reliable perennial, is a mid-spring bloomer that grows to 16″-18.” It’s great for cut flowers. I could not pass up this Darwin hybrid “Hakuun,” pure white with a hint of green on the sepals. It hails from Japan and grows to 16″-18″ tall. I took a chance with a few of the selections because I just could not resist them. Take a look at “Elegant Lady,” the ‘color of butter cream frosting with a pale pink overlay,’ says the wording under the picture. How could I resist such a delicious bloom even if it only blooms one season? Then I planted a river of “Daydream” Darwin hybrids that open yellow and mature to a soft apricot orange. I’m thinking sherbet when I see these 18″-20″ blooms in the catalog. And this tulip possesses a mildly fragrant aroma. 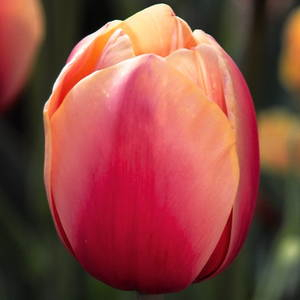 “Marit,” a Darwin hybrid described as ‘a glowing blend of cherry red and primrose yellow with a bit of chartreuse’ was another irresistible tulip. A mid-spring bloomer, it grows 14″-18″ tall. 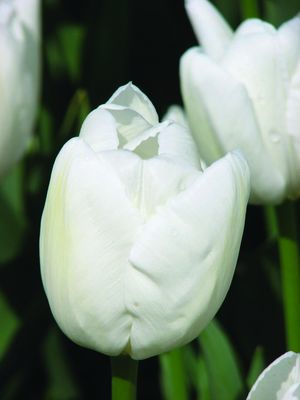 The Darwin hybrid tulip bulbs should be planted about 8″-10″ deep. 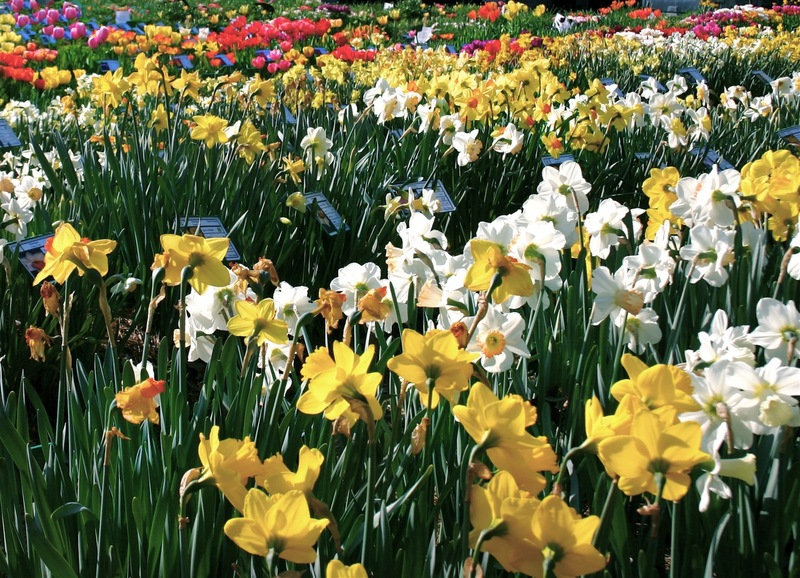 This prevents the bulb from splitting up into new bulbs that are non-flowering and helps the flower to have thicker stems. 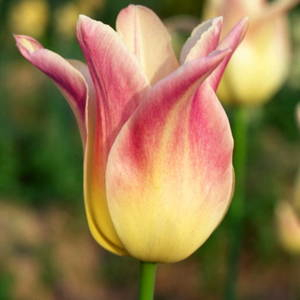 Remove the flower as soon as it is spent to allow energy to go into the bulb rather than seed production. A low-nitrogen organic fertilizer in the spring is advised. 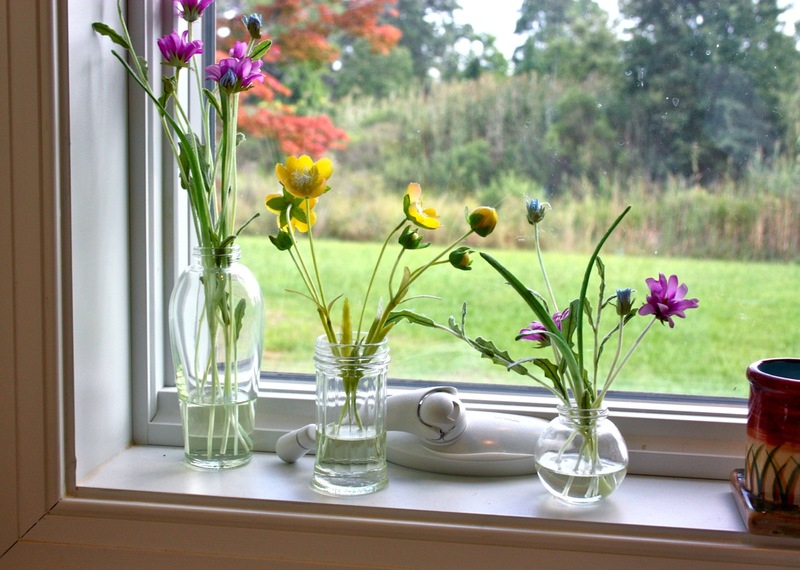 Allow the foliage to completely wither away before you remove it. 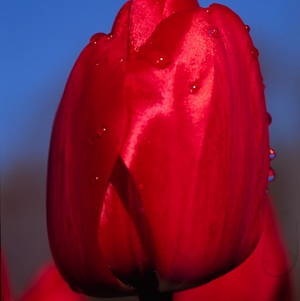 Avoid irrigating tulips. They like it dry. 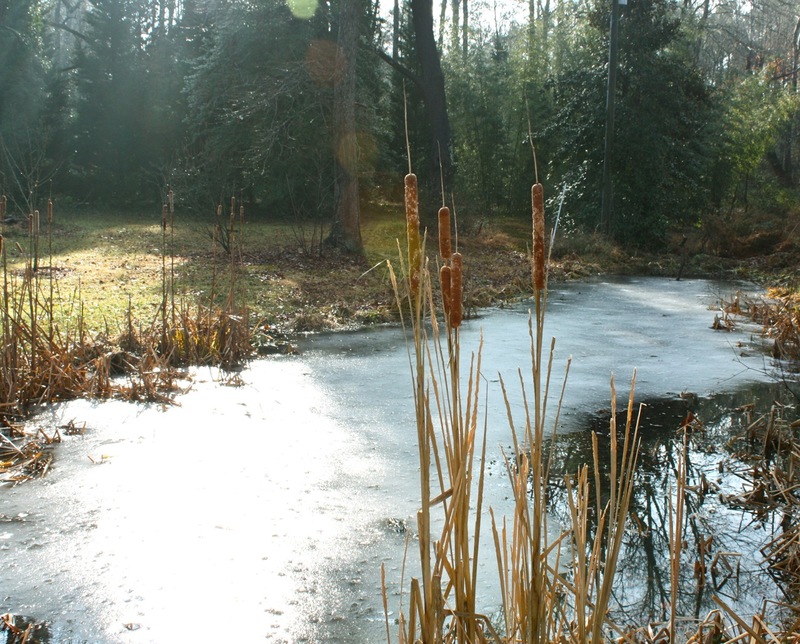 Even though it’s January and even though we still have ice on the pond and even though we have slushy piles of snow heaped here and there, I can see subtle signs that spring is in the air. To speed the process, I bought my first ever garden gnome which I will hide beneath some low hanging branches behind the row of daylilies. 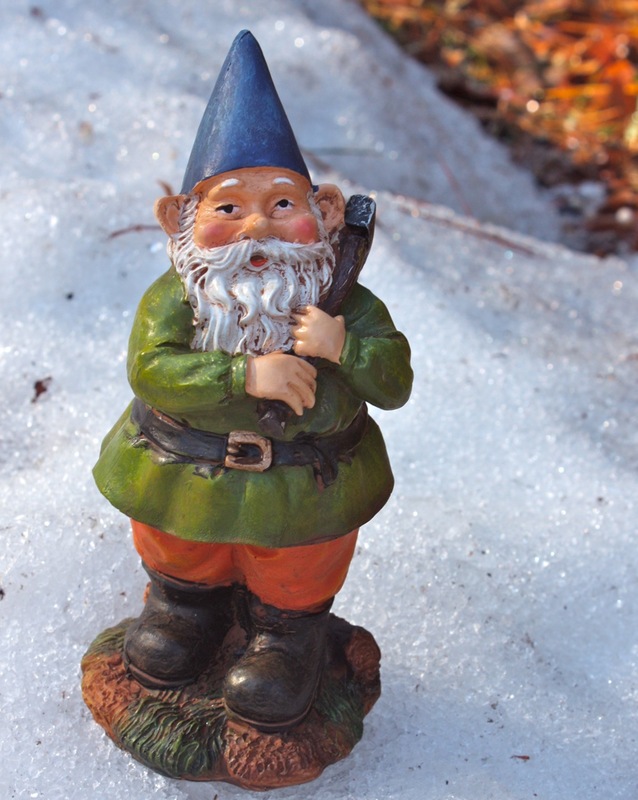 If the legend is true, this little gnome will help me in my gardens… perhaps making sure that warmer weather is on the way. If you pay close attention can you see the early indications of spring. Seed catalogs are arriving. Buds are swelling on trees and shrubs. Flocks of robins are plentiful. More people are walking and jogging and they’re wearing lighter jackets! We’re seeing more sunlight each day and the tiny green tips of daffodils, hyacinths, crocus and tulips are visible everywhere. Amazingly, on sunny afternoons I’ve spotted an insect or two outdoors against the window. Yes, positive signs of spring are in the air. Fellow blogger, Les of Smithfield Gardens, blogged about his annual trip to the Mid-Atlantic Nursery Trade Show in Baltimore. His photos are a preview of the lush foliage and flowers we’ll be seeing in nurseries in the weeks to come. I can hardly wait. So the season is changing. And if you are vigilant and attentive you will see some signs. 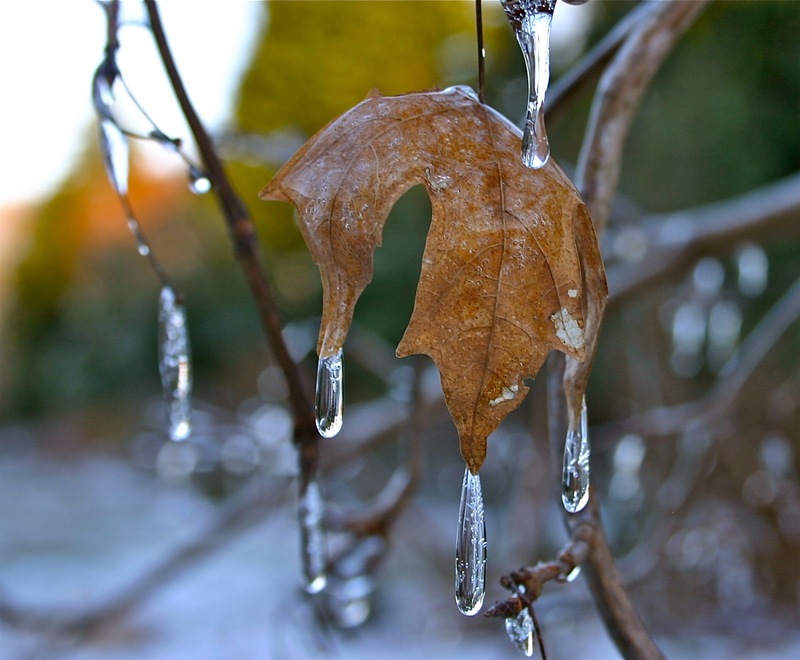 Winter is beginning to loosen its grip on us and spring is almost within reach. I am ready! 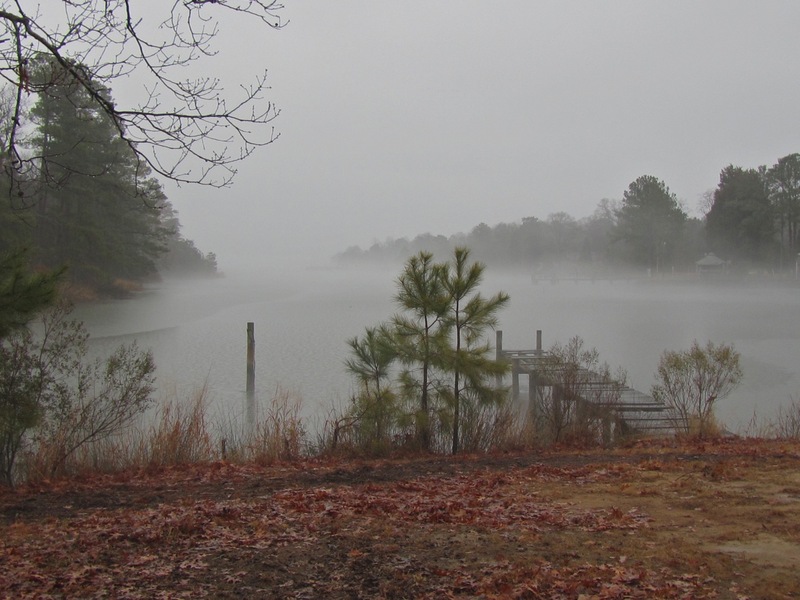 I spent my elementary years in Newport News living just off a lane named for the cedar tree. I thought it was an awesome cedar-lined road with trees that seemed tall and majestic to my little self. My bike was parked beneath many of the cedars that had a foothold or low enough limb that I could reach by standing on the seat of my bike. High up in the trees, limbs seemed comfortable, a perfect saddle for a youngster to idle away a summer afternoon watching cars, bikers and walkers pass beneath me, unaware of the small monkey clinging to the rough branches high in the tree enjoying the sights and the the pungent aroma of the needles and cones. So it’s natural that I would have a fondness for these common native trees in the Virginia landscape. You will see them on the horizon, growing in fields, against fences, on the waterfront, and in the middle of your flower bed. It is a rugged tree and a true survivor. 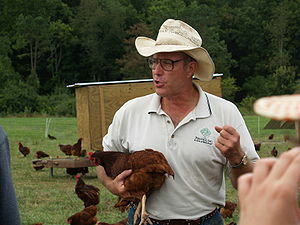 The seeds of the female are spread far and wide by birds. Often it’s the first plant to sprout out of cleared land and one that I must continually weed from my borders. 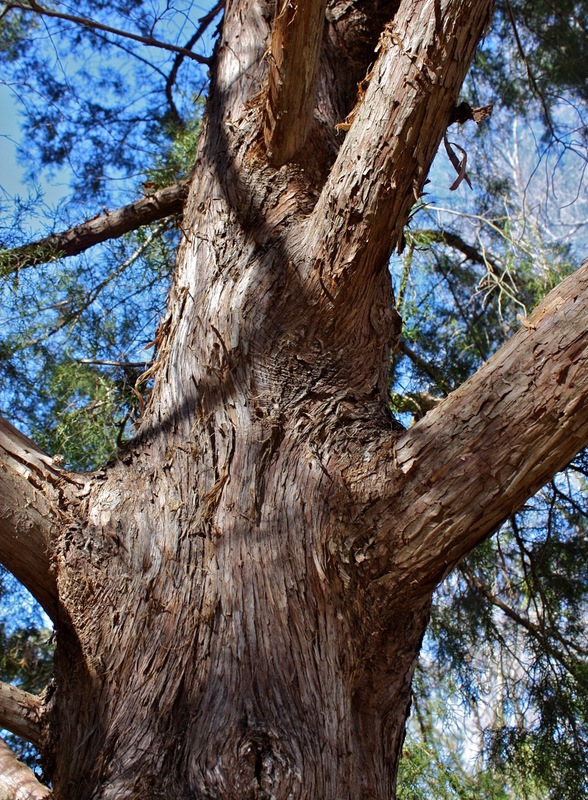 Not really a cedar at all, the Eastern redcedar or red cedar (juniperus virginiana) is a juniper, growing from Maine southward in the east and areas in the midwest. It’s a tree that is regularly cleared from sites as an undesirable. But the tree is very desirable to birds. Walking past one of our tall redcedars during our last big snow two weeks ago, I startled at least 20 little brown birds that had been hunkered down in the shelter of the tight foliage. 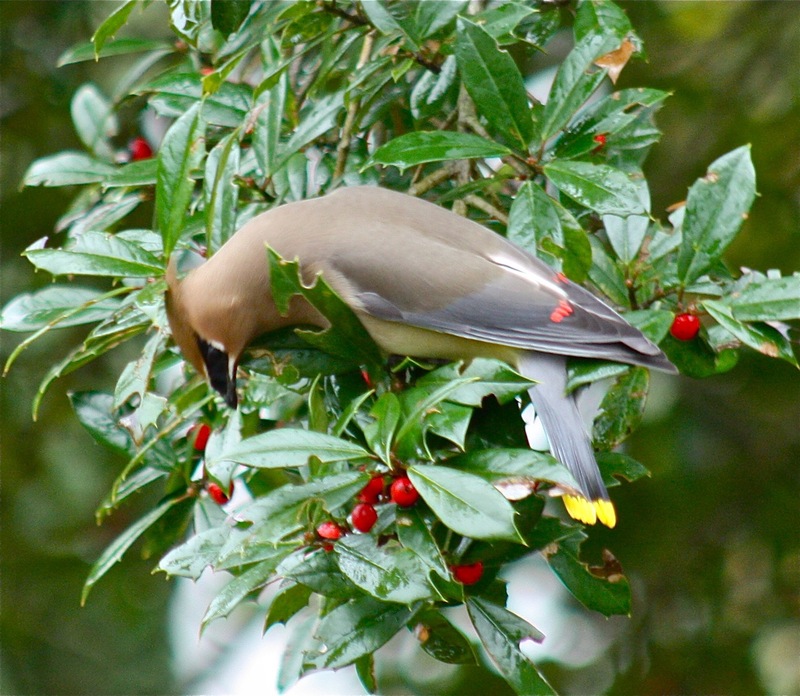 Not only does the tree provide great protection in wintry weather, the redcedar provides food for birds, squirrels, and other animals. The female produces delightful miniature frosted blue cone clusters on the evergreen branches that are used often in flower arrangements in our garden club. Cedar closets, cedar drawers, and cedar blocks to repel moths in closets and drawers come from the aromatic red wood of the red cedar. 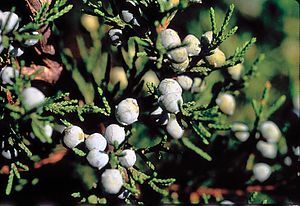 Finally, here’s a little fact about junipers: the word gin is an English shortening of the Dutch word Genever, meaning juniper, the cone of a which is a main flavoring in the drink. Add in a number of medicinal uses of the redcedar throughout history and this juniper tree has earned its place in the environment. So when mister gardener complains that one majestic redcedar is shading his vegetables too much, I say to him, “Move the garden.” This old tree will be here for hundreds of years! Too much shade for mister gardener? It’s been almost a year that I followed a live online chat at the Daily Press with Kathy Van Mullekom, Garden Editor, and Phillip Merritt, landscape architect and native plant expert. 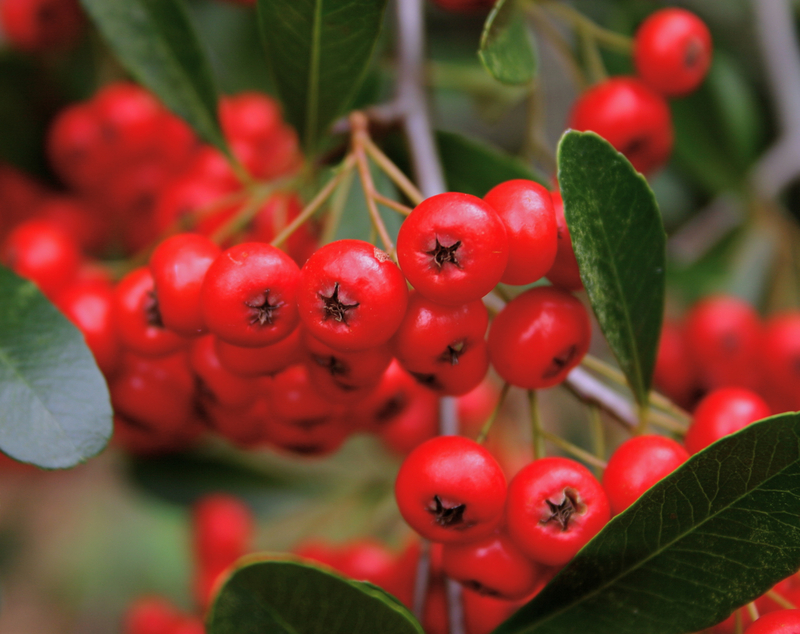 Kathy asked her guests to name 5 native plants they would choose to plant in their landscape and she answered first. I was delighted that she picked the Eastern redcedar (Juniperus virginiana)as one of her choices as a windbreak and to provide privacy from neighboring yards. It’s a common native tree dear to my heart. This former tree climber thanks you, Kathy! 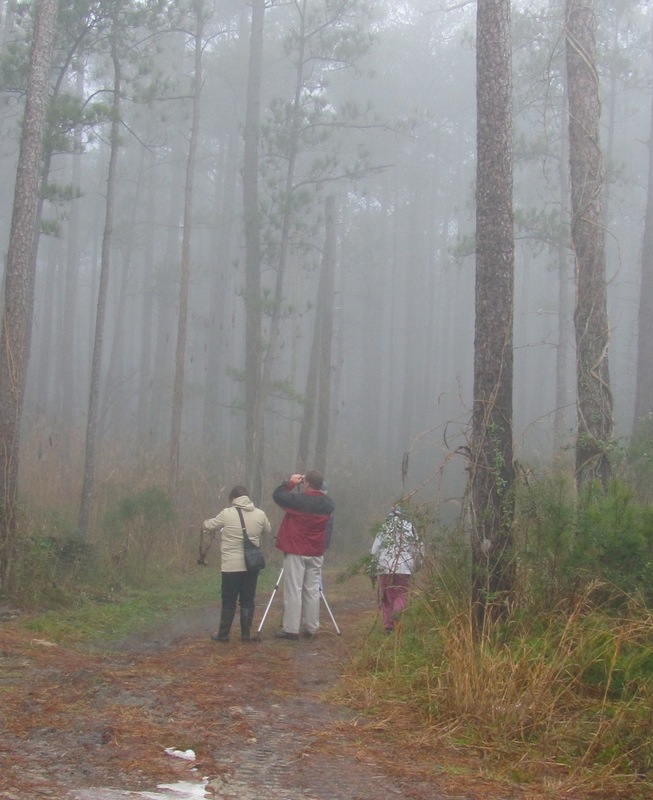 If you love being in the great out-of-doors and if you love birding and being with like-minded friends, then the Christmas Bird Count is the perfect wintertime activity for you. 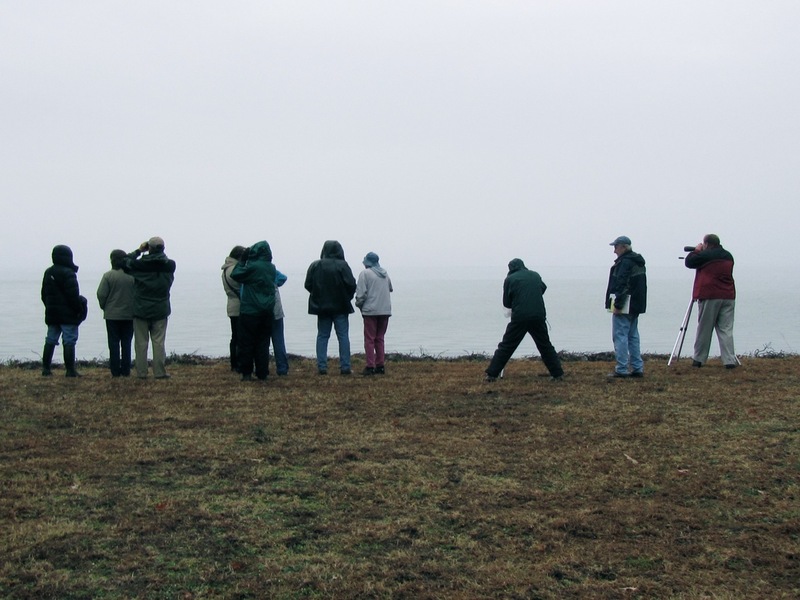 This National Audubon Society sponsored event, begun on Christmas Day in 1900, collects data for a study of the long-term health and status of bird populations across North America. 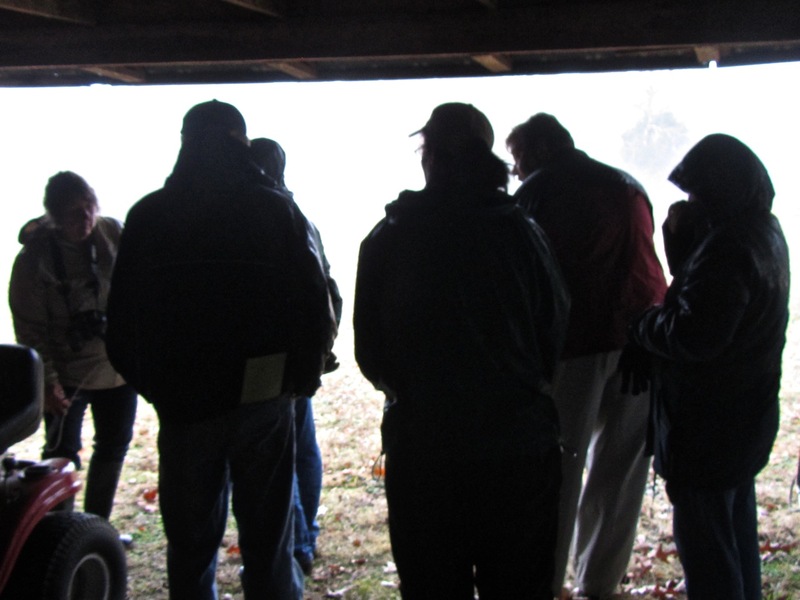 Our local team of a dozen volunteers walked and drove within the 15-mile radius of our assigned area of the count circle in Mathews and Gloucester Counties on Sunday (no hunters! ), January 2. 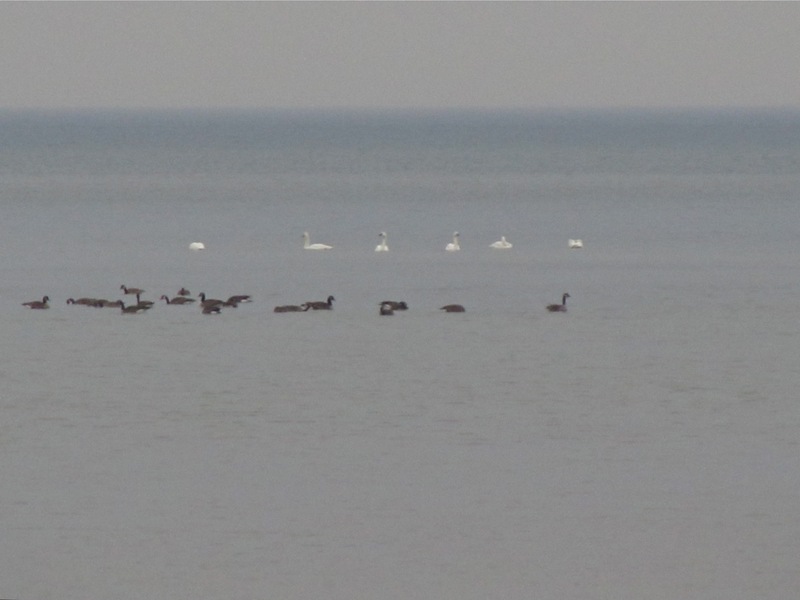 The combined information is available on a CBC database on the Audubon website where you can view historical counts, track a species, check maps or make a graph. Yesterday’s weather forecast was favorable: a high of 57 degrees, morning showers predicted to end when a front pushed through in the afternoon. This seemed to be an improvement over a year ago when 19 degrees and howling winds caused my camera to freeze after the first few shots. 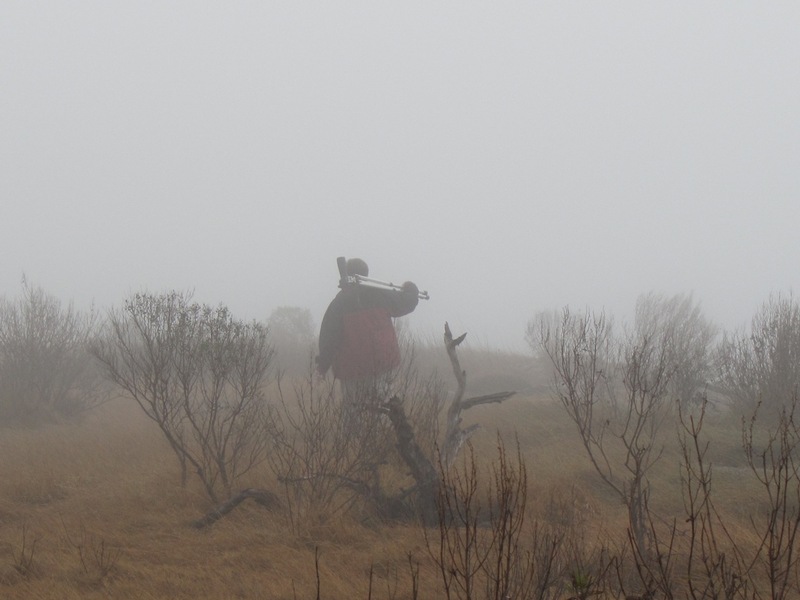 However we were disappointed to awake in the wee hours to drizzle and heavy fog on this year’s 110th Christmas Bird Count. 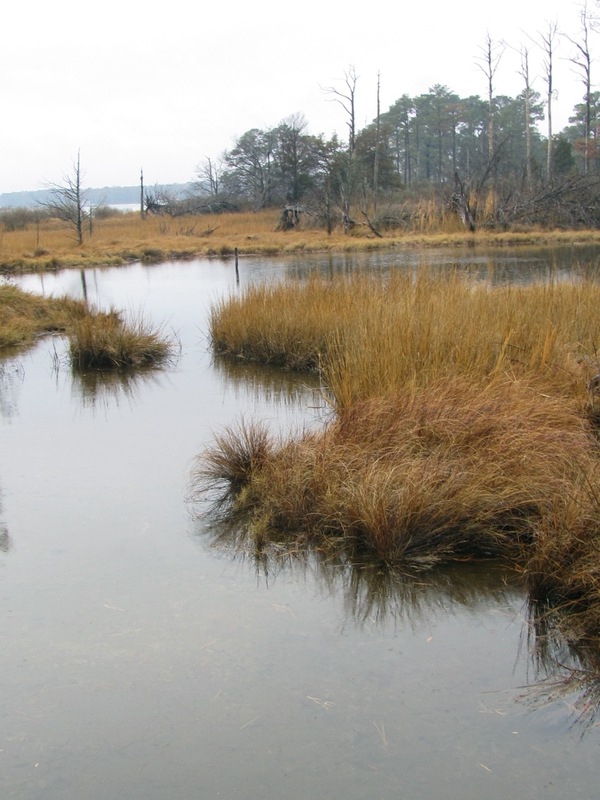 Most of our counting takes place over rivers and creeks and marshes where it was difficult to see much at all early in the day. 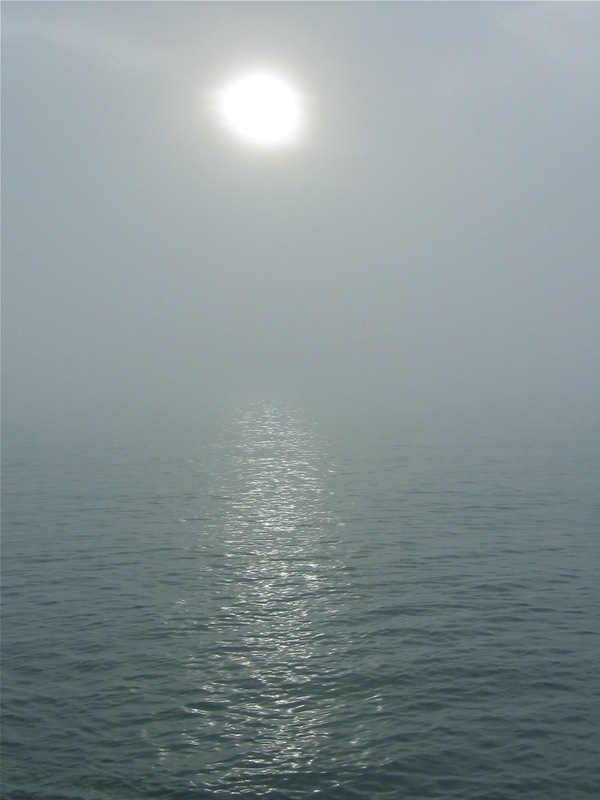 Fog rolled in the pre-dawn light, then lifted for brief moments, allowing us to count and estimate thousands of birds on the waterways of Gloucester. 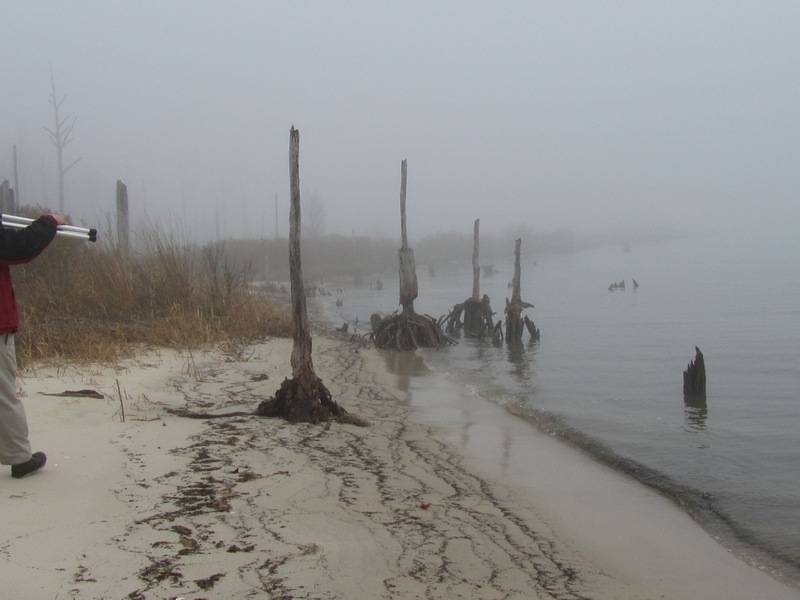 Heavy fog on low lands obscured most of the water and shore. We hear them. We just can't see them. 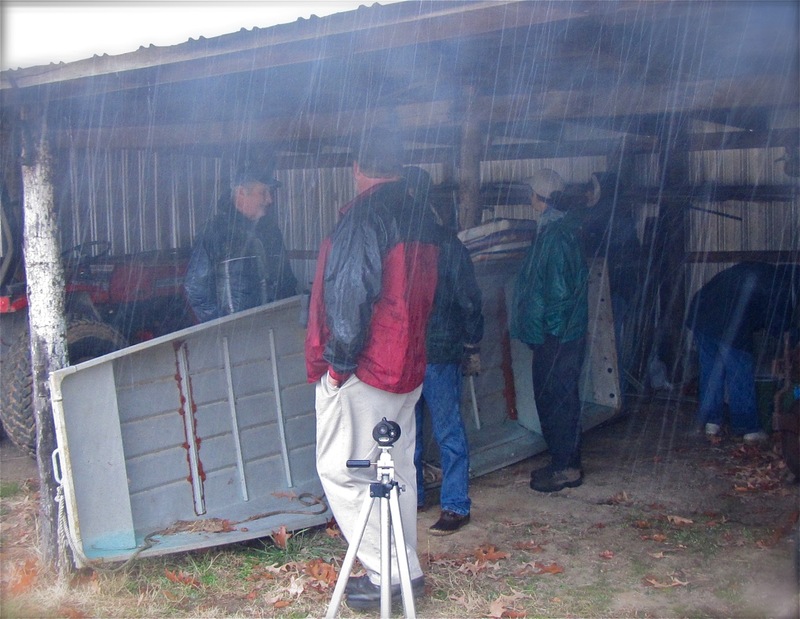 ... only to be dashed with the arrival of the front and heavy rains. Yet, here we counted numerous small birds seeking protection from the rain just like us! 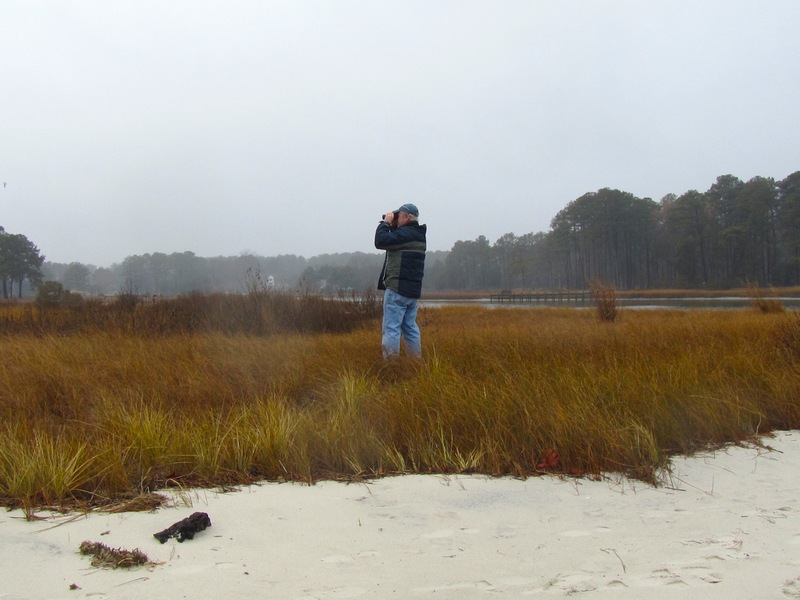 Although afternoon temperatures dropped 10 degrees with gusting winds and intermittent rains all afternoon, we covered much ground in Ware Neck with good results. Drying out that evening while tallying our counts we were satisfied with the final bird census of the day. Despite not seeing some familiar birds like vultures and some songbirds, we were pleased with the variety and number of birds that we reported this season.